This entry was posted on Tuesday, December 4th, 2018 at 10:39 am. 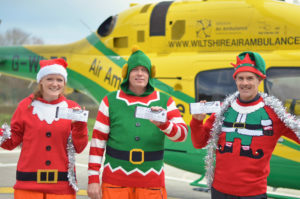 WITH less than three weeks to go until Christmas, why not take part in Wiltshire Air Ambulance’s Christmas raffle? As well as being in with a chance of winning a cash prize, you will also be helping Wiltshire Air Ambulance to continue flying and saving lives. The main winner in the Christmas raffle will receive £3,000, while £500 and £100 is on offer for second and third prizes respectively, plus a further five consolation prizes of £50. There is also the chance to win £100 in Marks & Spencer vouchers in an early bird prize draw. Raffle tickets cost £1 each and are available in books of five from Wiltshire Air Ambulance’s charity shop in Maryport Street, Devizes, and the airbase in Semington. Beth Gardner, fundraising manager at Wiltshire Air Ambulance said, “Our Christmas raffle is a great way to support your local air ambulance as it raises vital income to help keep our lifesaving service operational. The deadline for entry into the raffle is 17th January 2019, with the draw date on 24th January. The closing date for the early bird prize is 18th December. If you would like Christmas raffle tickets, please call the charity team on 01225 300536 or email hello@wiltshireairambulance .co.uk. Players must be aged 16 or over. Hi.any way to purchace tickets on line with debit card please?